As our thoughts start turning to spring, come along with Tidbits as we explore a place where there is no spring, no autumn, no winter— only perpetual summer: the jungle rainforest. •	Why is the jungle so diverse? 30 million years ago, the area that is now the Amazon jungle entered a long dry period. The tropical rain forests growing there at the time were wiped out, and only isolated pockets of jungle surrounded by vast grasslands remained. Each pocket of jungle followed its own evolutionary course over thousands of years. •	When the climate once again became warm and wet following the last ice age 10,000 years ago, the different types of jungle grew together again, with each forest contributing many different species of plant and animal. •	As a result, the South American forests are the most diverse in the world. Whereas many temperate forests are composed largely of just a few species of tree, in the Amazon you may have to travel a mile or more to find two trees of the same species. •	In any North American forest it is rare to find more than 15 species of tree in the entire ecosytem. In the Amazon, a five-acre plot may contain between 100 and 250 different species. •	In the northern deciduous forests of the temperate climates, every tree drops its leaves at the same time, triggered by the change of seasons. Thus, each year the forest floor receives a huge boon of nutritious new dead material all at one time. This stuff gradually turns into rich soil. fied as a rainforest? Amazon basin? 2. How many feet of rain fall in the 7. T or F: Over 150 different Amazon annually on average? languages are spoken by the 3. What part of the rainforest hosts various tribes in the Amazon. the most life forms: the floor or 8. The Amazon rainforest occupies the canopy? what percentage of Brazil? 4. What percentage of the world’s rainTRIVIA forests are cut down each year? APPLY APPLYNOW!! NOW!! Start Your Career with MasTec - USG Today! Start Your Career with MasTec - USG Today! Dame’s men’s basketball 1. In 2015, Detroit’s Miguel team reached the NCAA Cabrera set a record for Tournament’s Sweet 16 most home runs by a —1997, 2000, or 2003? Venezuelan-born player. Who had held the mark? 5. Who was the last NAS2. Alex Rodriguez, in in 2015, CAR Cup driver before Kyle Busch in 2015 to set a record for most career win three consecutive RBIs by an A.L. player. races? Who had been at the top 6. How old was tennis star of the list? 3. How many losing seasons did Martina Navratilova when she appeared in her last the Lakers have during their Grand Slam singles final? 12 years in Minneapolis? •	After the trees are cut down in a tropical rainforest, nutrients in the soil disappear after only a few harvests of crops, and the soil is soon lost entirely to erosion, never to be replaced. Once the forest is cleared, it is extraordinarily difficult to reverse the damage. government, thanks to the conservative movement. In most European countries, there is nothing like such movement, and the limited-government tendency is relegated to think tanks and small political parties, where it usually has no real influence. Trump as the leader of the Republican Party would, in effect, reject limited-government conservatism and instantly make the GOP at the presidential level more like an accommodationist center-right European party in which a Ted Cruz would have no home. Of course, mainstream European political parties tend not to be nationalist or anti-immigration. Here, Trump bears a closer resemblance to Europe’s outsider parties on the right. He is less the candidate of American exceptionalism — which has a keen appreciation of our national creed as enunciated in the Declaration and the limits on government power set down by the Constitution — than a robust nationalism of a blood-and-soil variety found nearly everywhere else in the word. Trump’s understanding of the Constitution — the most valuable American contribution to the art of self-government — runs somewhere between attenuated to nonexistent. He has lately been making noises about loosening libel laws so that he can more easily sue publications for printing things he doesn’t like. On “Fox News Sunday,” he complained that “in England, I can tell you it’s very much different and very much easier.” Yes, it is — because England doesn’t have a First Amendment. The United States happens to have a bulwark of free speech written into its foundational law, although Donald Trump apparently can’t fathom why. You can say this about a Donald Trump-Hillary Clinton race: It will be more nasty, personality-driven and entertaining than anything we’ve seen in decades. It will also, in important respects, be less American. Rich Lowry is editor of the National Review. © 2016 by King Features Synd., Inc.
•	Covering about 2.1 million square miles of land, the Amazon rainforest is about two-thirds the size of the U.S. The Amazon covers approximately 40% of the South American continent. If the Amazon were a country, it would rank 9th in size. •	Around 60% of the Amazon is in Brazil; 13% in Peru; 10% in Columbia; and six other countries split the rest. •	The Amazon comprises a little more than half of the world’s rainforest, and a third of the world’s forests overall. •	The Amazon harbors the densest variety of life on the planet, hosting over 40,000 plant species including 16,000 kinds of trees alone, as well as 1,300 types of bird, 3,000 kinds of fish, about 430 mammal species, and an incredible 2.5 million kinds of insects. •	Researchers estimate that they have discovered and cataloged only one-sixth of the species that live in the Amazon. •	A plot of rainforest 100 acres in size may contain as many frog species as can be found in all of North America. •	More species of fish live in the Amazon River than in the entire Atlantic Ocean. •	Over 100 types of plants can be found growing in the branches of a single mature tropical tree, along with 1,700 kinds of bugs. Fifty different types of ants may inhabit a single square yard of jungle floor. •	The Amazon River is the world’s largest river by volume. It originally ran westward into the Pacific Ocean, but as the Andes Mountains rose, it shifted course and now runs eastward, draining into the Atlantic Ocean. •	The Amazon River is 4,000 miles long and only the Nile River is longer. It has over 1,100 tributaries. •	It was British art critic and social reformer John Ruskin who made the following sage observation: "Sunshine is delicious, rain is refreshing, wind braces us up, snow is exhilarating; there is really no such thing as bad weather, only different kinds of good weather." •	After the events of this past winter, you may not be surprised to learn that sales of cakes, cookies and candy spike when a blizzard is in the weather forecast. •	You've almost certainly heard of "M*A*S*H," one of the most popular TV series of all time. One of the main characters on the show, which ran from 1972 to 1983, was Corporal Klinger, played by Jamie Farr. It's interesting to note that in the 1950s, Farr actually served as an enlisted man in the U.S. Army in Korea -- and the dog tags he wore on the show were the same ones he wore during his service. •	For reasons that are not quite clear, inventors have created a robot that can solve a Rubik's cube in slightly more than one second. •	In 18th-century France, there was a Parisian printer who employed several apprentices, all of whom lived in the home of the printer's family. The printer's wife was, evidently, a lover of cats -- and her cats begged for scraps and screeched at all hours of the night. Finally fed up with the felines, the apprentices took matters into their own hands: While the family was out of town, they held a formal trial, complete with guards, a confessor and a public executioner. After they were pronounced guilty, the accused felines were strung up on cat-sized gallows. *** Thought for the Day: "Politics, as a practice, whatever its professions, has always been the systematic organization of hatreds." -- Henry Adams © 2016 King Features Synd., Inc.
•	In terms of sheer numbers of individuals, ants are among the dominant species on earth. •	Ants, which evolved from wasps, are perhaps the most highly developed social insects. There are about 400 different species of ant in the U.S. alone, and about 15,000 species worldwide. •	To find food, a typical harvester ant will go straight out from the nest for up to 50 feet, and then start wandering. When it finds food, instead of following the round-about trail back to the nest, it will head for home in a beeline, thus refuting speculation that all ants follow a scent trail home. If the soil in front of an ant is scraped away or covered, the ant will continue its direct course. However, if the ant is placed inside an enclosure from which it is unable to see surrounding landmarks, it will lose its way until the enclosure is removed. Furthermore, if the ant is picked up and transferred to a new location, it will re-orient itself without hesitation, unless it is put down outside the area in which the ants of that colony forage, in which case it will wander about, lost. •	Ants may use large landmarks to find their way home, as well as the position of the sun. If an ant is entrapped in a box in the dark for an hour, when it is released it will strike out again in a direction different from the original direction by an angle equal to the number of degrees the sun has moved during the hour. •	Some species of ants do leave a scent trail to mark the way back to the food. When a forager makes a discovery, it becomes excited and secretes an odorous substance from the abdomen as it returns to the nest. Other ants follow the trail to find the food. •	One researcher was able to prove conclusively that ants will follow a scent trail to food. The scientist placed food near an anthill and covered the distance between with sheets of paper. After the first ant discovered the food and rushed back to the nest, he replaced the original paper with fresh sheets. When the ants swarmed out to get the food, they were unable to find it. •	Another naturalist devised a test that proved that ants can measure, estimate, and communicate. He chopped a grasshopper into three parts: a small section, a medium section, and a large section. He then gave each section to a different ant scout from the same nest. All of the pieces were too big for a single ant to carry. Each ant measured its section with its antennae and then returned to the nest. Would each ant call out the same size crew? Would too many show up to do the work, or too few? The naturalist was surprised to see that 28 ants returned to fetch the small piece; 44 went for the medium piece; and 89 for the large piece. The second crew was twice as big as the first, just as the medium piece was twice as big as the small; and the large crew was twice as big as the medium crew to move a piece that was twice as big. •	When ants find a puddle of fruit juices or a dollop of jelly, they will chew a leaf into a spongy mass and then place it in the middle of the food. When they return later, the leaf has absorbed the juices and the ants carry it home. •	Queen ants can live for 20 years. Female worker ants can live as long as ten years. Male ants, however, live only a few weeks. They die immediately after mating. •	One typical Maryland woodland was estimated to contain 1.3 million ants per acre. •	Ant blood is colorless. •	On March 22, 1765, to raise funds to pay off debts and defend the new American territories won from the French, the British government passes the Stamp Act. It levied a tax on all materials printed in the colonies, from newspapers and pamphlets to playing cards and even dice. •	On March 25, 1911, the Triangle Shirtwaist Company factory in New York City burns down, killing 145 workers. Owners had refused to install sprinkler systems and take other safety measures in case they needed to burn down the shop to collect fire insurance, a not uncommon practice at the time. •	On March 23, 1937, Craig Breedlove, the first person to reach land speeds of up to 600 mph in a jet-powered vehicle, is born. He designed a three-wheeled, rocket-shaped vehicle powered by a surplus military jet engine and dubbed it the Spirit of America. •	On March 27, 1945, Nazi Germany launches its last V-2 long-range rockets, killing 162 civilians in England and Belgium. The V-2 could carry a 2,000-pound warhead and became the precursor of the ICBM of the postwar era. •	On March 26, 1953, American medical researcher Dr. Jonas Salk announces that he has successfully tested a vaccine against the virus that causes polio. In 1952 -- an epidemic year for the crippling disease -- there were 58,000 new cases reported in the U.S. •	On March 21, 1965, in the name of black voting rights, 3,200 civil-rights demonstrators, led by Martin Luther King Jr., begin a historic 54mile march from Selma, Alabama, to the state capitol at Montgomery. •	On March 24, 1989, the worst oil spill in U.S. territory begins when the supertanker Exxon Valdez runs aground on a reef in Alaska's remote Prince William Sound. An estimated 11 million gallons of oil was released and eventually covered 1,300 miles of coastline. • Here’s your springtime reminder: As you install your window screens to air out the house (or even if you keep them up year-round), double-check to make sure they are pet-secure. Cats love a windowsill, and they can fall through and out the window if screens are not secure. If you have a pup, you may want to give it the push test — it should be able to withstand Fido’s nose jammed against it! • To preserve your manicure in the garden, wear gardening gloves. If you love the feel of dirt in your hands but don’t love dirty nails, simply rake your nails over a bar of soap before you dig in. The soap gets under there, keeping dirt out. Bonus, it’s easier to wash your hands afterward! • “If you use ground chicken or turkey to make lower-fat meatballs, give them some time to firm up by making the meatballs and putting them in the fridge for an hour or so. They hold together much better that way.” — F.K. in Missouri • Some tips for working with garlic: To peel cloves, microwave for 10-15 seconds or cover in plastic (in a sandwich baggie or plastic wrap) and crush lightly with a glass bowl or plate. To chop or mince, spray your knife with cooking spray or put a few drops of oil on the clove itself, as this will keep the garlic from sticking to the knife. Finally, go ahead and crush that garlic by turning your knife on its side and pressing down hard. • Add an eraser to your whiteboard marker by gluing a small pompom on the end with a drop of hot glue. Use giftwrap tape to tape a small magnet to the side of the marker, and it’s ready to go up on the fridge with your dryerase board. Send your tips to Now Here’s a Tip, 628 Virginia Drive, Orlando, FL 32803. © 2016 King Features Synd., Inc.
•	Josephine Cochrane was a wealthy woman who lived in Illinois. She gave a lot of dinner parties and was very proud of her china. She collected rare and expensive dishes. However, her servants weren’t particularly careful with the priceless dishes when they washed them after each party. Pieces were broken; pieces were cracked; pieces were chipped. Josephine took to washing the dishes herself by hand while wondering why there wasn’t there a machine that would wash the dishes for her. •	She decided to invent one, setting up a workshop in her woodshed. Dishes fit into a rack; the rack fit into a wheel; the wheel fit inside a tub; the wheel turned while hot soapy water squirted up from the bottom of the tub. Shortly after she perfected the design, her husband died. She was left with little money and a lot of debt. She needed to turn her idea into a way to make a living. •	She patented her design in 1886 and her wealthy friends immediately starting ordering the Cochrane Dishwasher for their own luxurious kitchens. A Chicago machine firm began to manufacture them while Josephine managed the company and marketed the product. She later said that designing the dishwasher was far easier than marketing it. •	The home model did not sell well. Few homes had electricity. Water heaters were rare. Most municiple water systems offered only hard water which did not make soap suds. The price tag of $150 would be equivalent to about $4,500 today. •	Housewives often felt that soaking their hardworking hands by washing the dishes in hot soapy water was a relaxing way to end the day. Cochrane changed her sales pitch to point out that water in dishwashing machines was far hotter than human hands could stand and therefore resulted in germfree dishes. DIFFERENCES: 1. Sweater ribbing is missing. 2. Books are missing. 3. Fence board is missing. 4. Scarf is shorter. 5. Poster is missing. 6. Arm is moved. © 2016 King Features Synd., All rights reserved. •	The strongest market for the dishwasher lay not in private homes, but in industries. Hotels, restaurants,Dell. boarding houses, and hospitals saw the Answer: advantage of being able to wash, scald, rinse, A VERY LARGE NUMBER and dry up to 20 dozen dishes of all shapes and •sizes Edward Kasner was a mathematician. In 1938 in two minutes. he was asked to come up with a name for a •	She gotlarge her big breakthe when she not only exhibvery number: numeral one, followed ited dishwasher theasked Columbian in by her a hundred zeros.atHe his twoExpo young 1892 in Chicago, but also sold her dishwashnephews what name they would suggest. ers to many of Milton the restaurants and other es• Nine-year-old suggested a name tablishments with vast kitchens catering to the out of the funnies. A cartoon strip character large crowds coming to see the Expo. Against named Barney was very popular. Milton chose heavy competition around the world, her Barney’s last namefrom for the number. received the the first •dishwasher Kasner announced new prize namefor for“the the best big mechanical construction for durability and adnumber in his next book, altering the spelling. aptation to a particular line of work.” One of • Sixty years later, Larry Page and Sergey Brin the concessionaires using her product sent her developed a new internet search engine. Other this glowing tribute: “Your machine washed search engines searched each webpage and without dishes eighttimes relays ranked delay them soiled according to left howby many a ofspecific a thousand soldiers each, completing term appeared on them, but Pageeach and designed their search engine to search for lotBrin within 30 minutes.” the specific term andtothen find outthehow many •	Cochrane continued improve product, links there were that led back to that page, producing models with revolving washing syswhich resulted in a better search engine. tems, a centrifugal pump, and a hose for drain•ing They needed the a clergy name who that into decided the sink. they She ignored reflected how many websites the search claimed the dishwasher was immoral because engine was searching. They took the name it of denied women the labor to which Godonly had Edward Kasner’s very large number, called them. She itignored thebeing serthey misspelled slightly,the sooutcry it endedofup vants who claimed it would put them out of spelled exactly the same way the cartoon business. company growing, pushed characterThe Barney spelledkept his last name. What’s byit Josephine Cochrane’s energy and ambition called? (Answer at bottom of page) until her death at age 74 inFACTS 1913. COMPUTER •	•Late in herBill lifeGates she said, I knew I know In 1981 said,“If “640 kb ofallmemory today wouldforhave had the courage to ought[I]tonever be enough anybody.” •start.” Moore’s Law states that computer performance doubles everywas 18 to 24and months, and ever since • The company sold eventually evolved 1971, has been division true. into thethis Kitchenaid of the Whirlpool dishwashers did notwere become •Corporation. HP, Google,Still, Microsoft, and Apple all started in garages. commonplace in ordinary homes until the 1950s. Answer: Google, from googol. 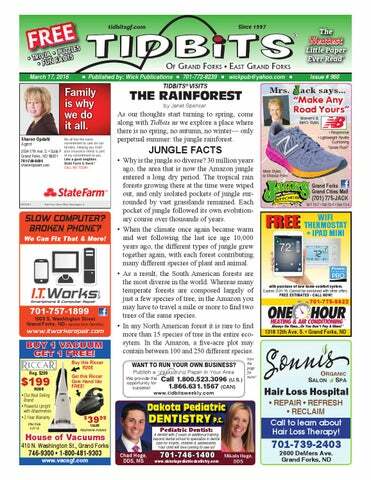 "The Rainforest," "Ants" and "Inventing the Dishwasher"